For its bicentennial, the brand has unveiled a 17-foot "wish fountain" that merges the digital and physical world. The BMO200 fountain was officially opened at an event to mark its anniversary year on Tuesday afternoon, with CMO Connie Stefankiewicz demonstrating to former Raptor Jerome “Junkyard Dog” Williams how to use the “coin toss” tool on its website. First, the marketer visited bmo200.com using a mobile device. Then, she invited Williams to choose a category. Each one corresponds to wishes BMO has helped make come true, such as with the category for creativity where “In 1996, we helped to find a new home for the National Ballet” or “In 2013, we helped create the largest mural in Canada to honour the LGBTQ community.” The 6’7″ basketball player chose the category “community” and wrote a wish for all kids to be able to play sport. That wish was then “tossed” into the virtual world (sliding his finger across the screen), and came out into the physical world as a digital representation of this wish on the giant fountain installation. 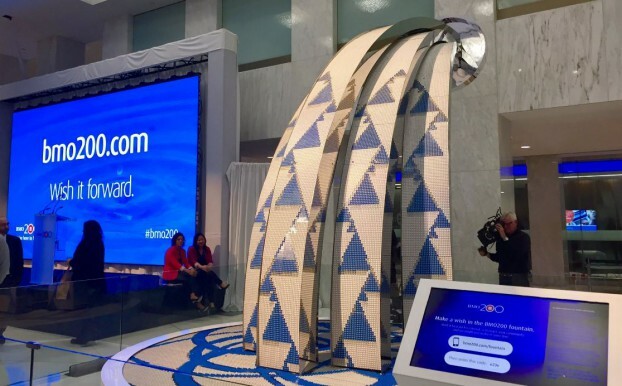 Some of the wishes, made by people and companies across Canada and the U.S., will be made true by BMO over the next year, and Stefankiewicz also announced that miniature wish fountains will crop up at BMO sponsored events across North America until its actual anniversary date on Nov. 3, when the bank will bring back the giant fountain for a larger celebratory event. The idea corresponds to the BMO brand’s overall “we’re here to help” positioning. The fountain was developed by agency Mosaic, with the technology and infrastructure coming from Globacore, web development and digital by Secret Location, along with Canadian multidisciplinary artists Jennifer Marman and Daniel Borins on the design – which displays and pays homage to an early technology called “flip dots” that were once used for train destination boards. Also for its 200th, the bank has released a book on its history, titled “A Vision Greater than Themselves: The Making of Bank of Montreal, 1817-2017,” written by McMaster University business historian Dr. Laurence B. Mussio.